ber of interviews and physical examinations. considered to reverse this process. cas, research shows a high level of obesity for both sexes. of obesity in more advanced ages . on Public Health, especially among children. periodic health surveys are still recent . obesity and the diseases related to it . mate are quite peculiar . men (urban area of southern Brazil) . tween the years 2008 and 2009 .
of life as one of its consequences . plications, as cardiovascular and metabolic diseases . ges, overweight can only be assessed in relation to height. 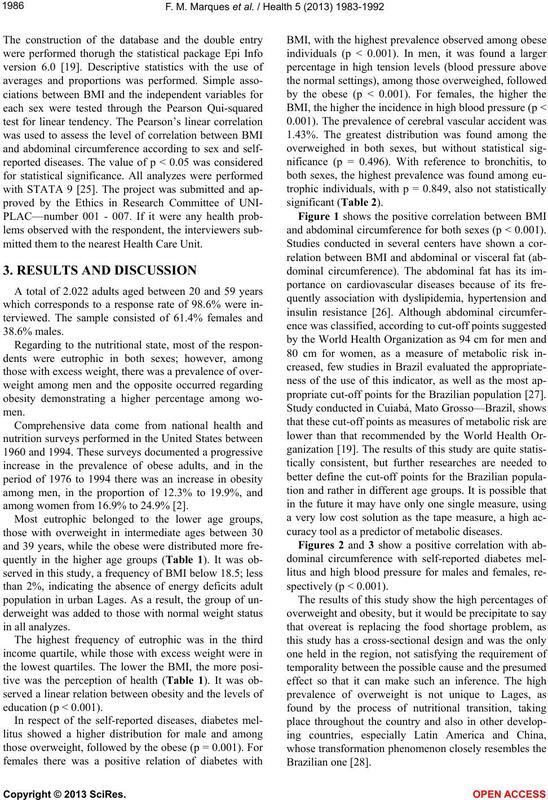 lean mass, which may overestimate the BMI. self-reported diseases of the urban area of Lages, SC. weight (in kilograms) and height (in meters) squared. vascular accident, diabetes, hypertension or tuberculosis. quently categorized into positive, regular and negative. completed education (<4, 4 to 8 years, 9 to 11 and >11). mitted them to the nearest Health Care Unit. among women from 16.9% to 24.9% . 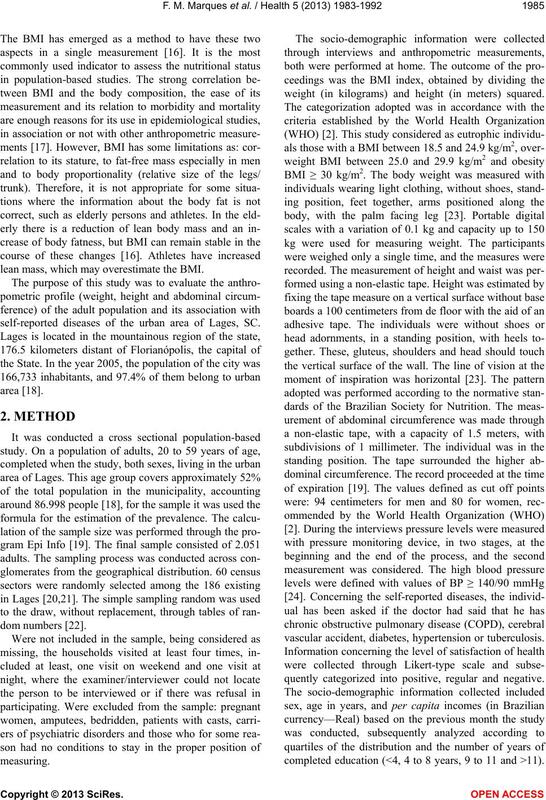 and abdominal circumference for both sexes (p < 0.001). propriate cut-off points for the Brazilian population . curacy tool as a predictor of metabolic diseases. *Pearson qui-squared test; **Linear tendency; ***A US dollar is worth R$2,20 reais (Brazil), a minimum wage is equal R$640,00 reais. lence in female population . Table 2. 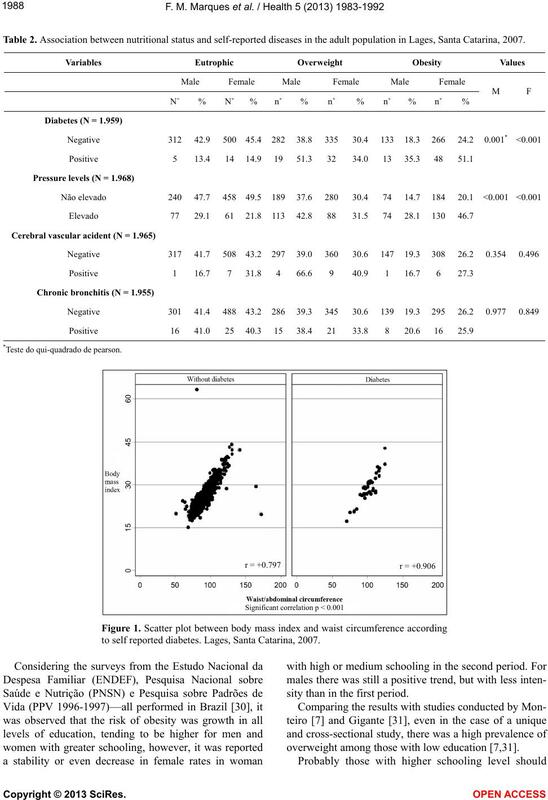 Association between nutritional status and self-reported diseases in the adult population in Lages, Santa Catarina, 2007. *Teste do qui-quadrado de pearson. to self reported diabetes. Lages, Santa Catarina, 2007.
sity than in the first period. overweight among those with low education [7,31]. cording to self reported diabetes in males and females. Lages, Santa Catarina, 2007.
sexes. 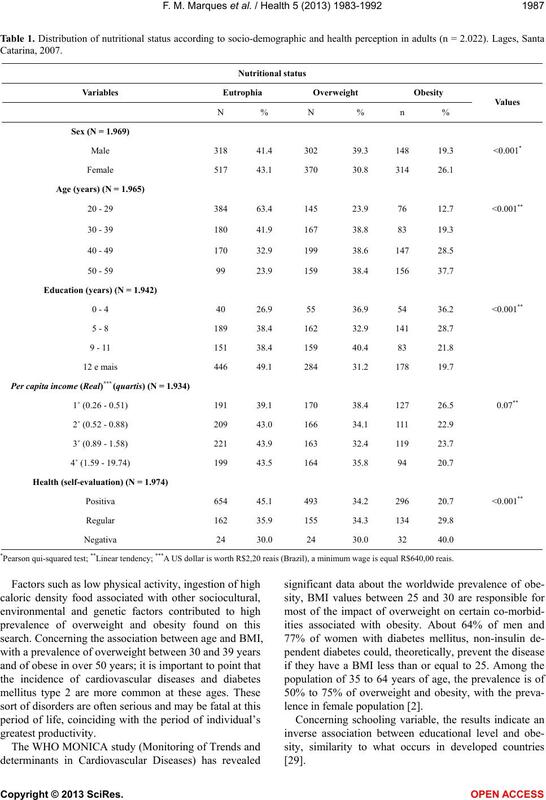 Lages, Santa Catarina, 2007.
calorie foods and practice regular physical activity. women belonging to the three highest income quintiles. nutritional transition took a century. crease in obesity, three hypotheses are objects of study. in this case, obesity would be a sequel of malnutrition. gions of the country [27,31]. 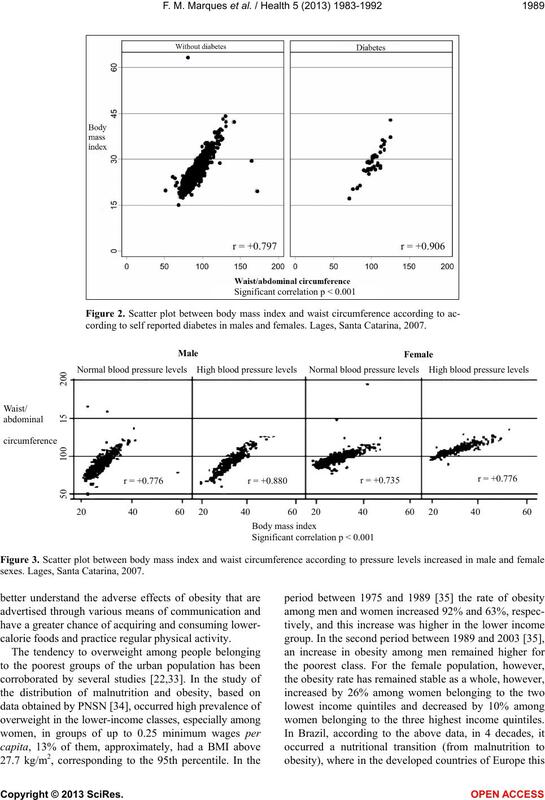 valence of obesity among people with greater incomes. social representation to be achieved. sisted regardless of the genre. aimed at all ages, with monitors and adequate health care. eating habits and increasing physical activity. vate sectors, based on their reality. vention and control of obesity . which may have lower quality and life expectancy. 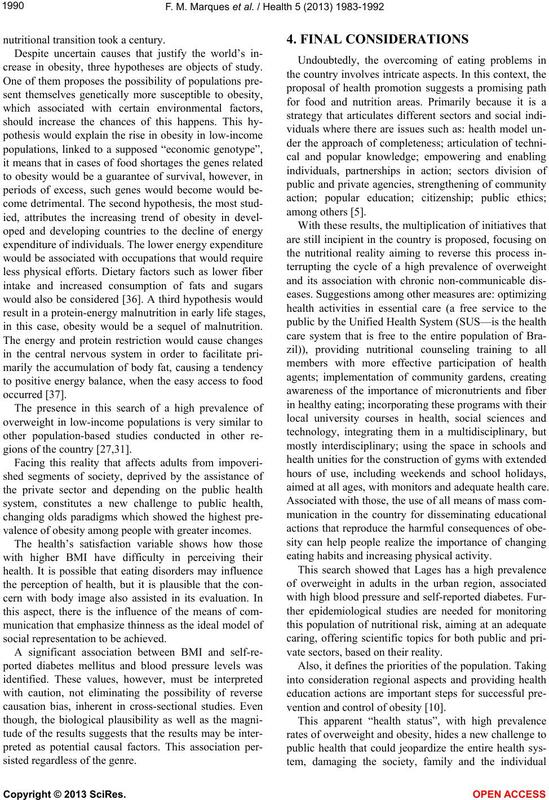 vista Brasileira de Nutrição Clínica, 21, 117-124.
the Who consultation of obesity, Geneva. the Nutrition Society, 68, 422-429. M.C.G.P., César, C.L.G., Carandina, L. and Goldbaun, M.
Pública, Rio de Janeiro, 23, 1674-1681.
na população adulta da Região Urbana de Lages, SC. Paulo Medical Journal, 129, 283-284. Brasil. Ministério do Planejamento, Orçamento e Gestão. scentes e Adultos no Brasil. Rio de Janeiro: IBGE. associados em Adultos. Cinergis, 13, 64-71.
of Medici ne, 341, 1097-1110. Corrada, M.M., Kawas, C.H., Mozaffar, F. and Hill, A.P. Journal of Epidemiology, 163, 938-949. Jousilahti, P., Tuomilehto, J., Vartiainen, E., Pekkanen, J.
ischemic heart disease in South Korean men and women. 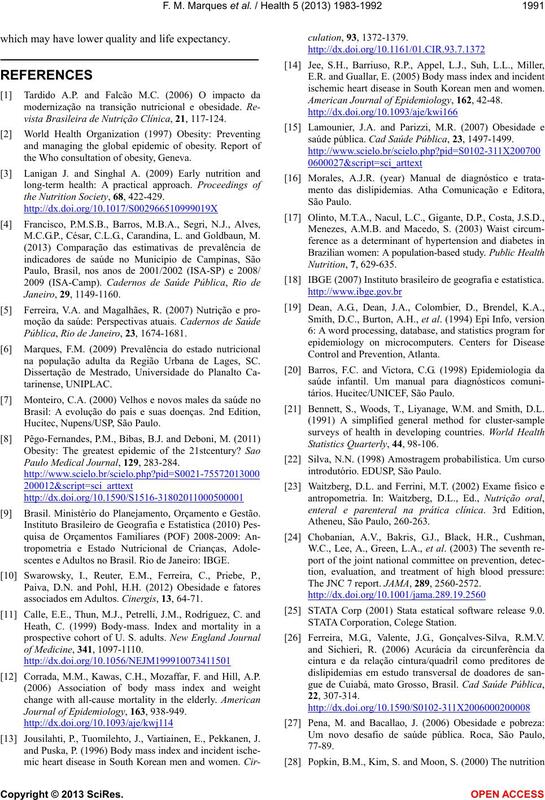 American Journal of Epidemiology, 162, 42-48.
saúde pública. Cad Saúde Pública, 23, 1497-1499. IBGE (2007) Instituto brasileiro de geografia e estatística. Bennett, S., Woods, T., Liyanage, W.M. and Smith, D.L. The JNC 7 report. JAMA, 289, 2560-2572. STATA Corp (2001) Stata estatical software release 9.0. Ferreira, M.G., Valente, J.G., Gonçalves-Silva, R.M.V. Pública, Rio de Janeiro, 19, 567-575.
seus fatores de risco. Rev Saúde Pública, 31, 236-246. 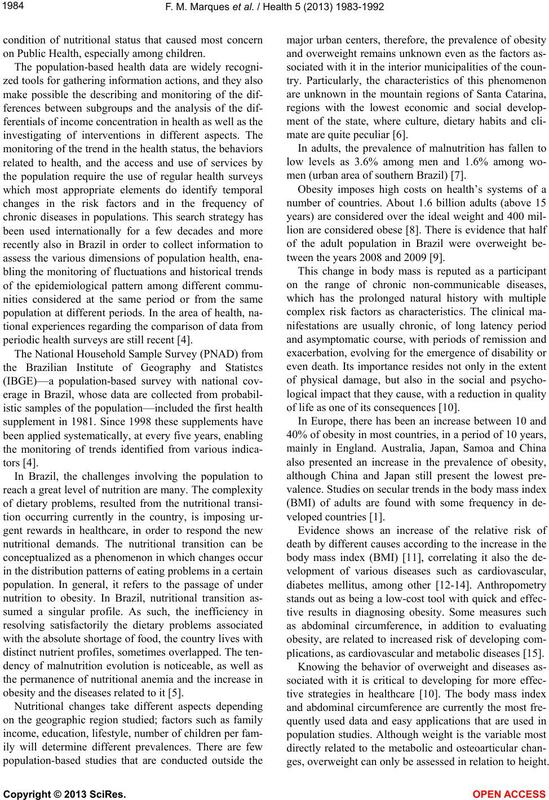 Monteiro, C. (2006) Transição epidemiológica no Brasil. countries of the South. Medecine Tropicale, 57, 380-388. 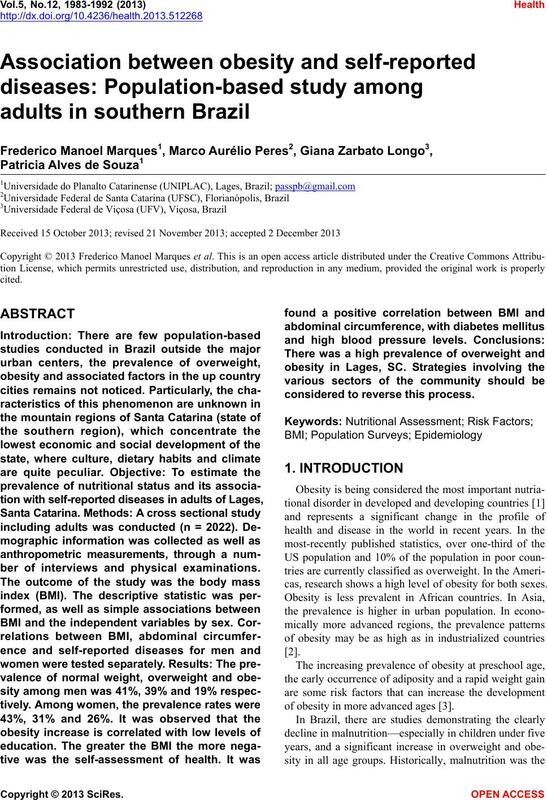 Income-specific trends in obesity in Brazil: 1975-2003. 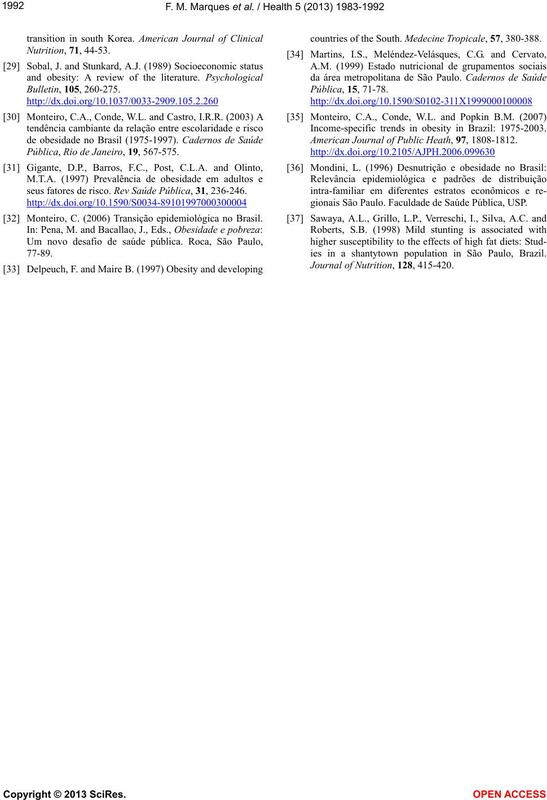 American Journal of Public Heath, 97, 1808-1812.
gionais São Paulo. Faculdade de Saúde Pública, USP. ies in a shantytown population in São Paulo, Brazil. Journal of Nutrition, 128, 415-420.